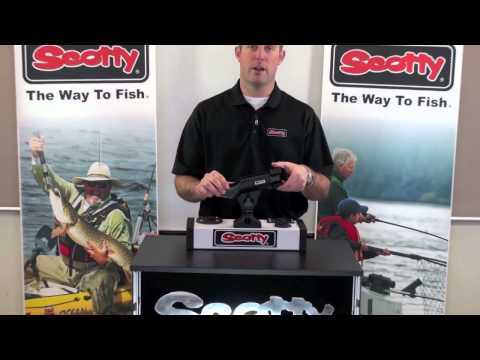 The Scotty Powerlock Rod Holder 230 is Scotty's most popular value priced, positive locking, open style rod holder. It's universal cradle holds almost any reel style and has a front locking ring to prevent rod loss when paddling. Manufactured with fiber reinforced engineering grade nylon, the Powerlock offers strength, resilience and reliability. The Powerlock also includes a No. 241 Side / Deck Mount which allows mounting on a flat deck surface or on the side of a gunnel of your canoe or kayak. Hardware not included. Great, sturdy, high quality product. I got this to mount to my FeelFree UniTrack. Install was easy (it didn't come with mounting hardware - which was fine - I wanted bolts and lock nuts for my mounting plate). It is easy to use. Holds everything from my bait caster, to my spinning reels, and my old Zebco 33 spincaster. The scotty rod holder fit on my feel free kayak well. use it to keep the rod I am fishing with handy while paddling to next spot. no problem with spinning or bait casting rod fitting the holder. sturdy built think it will last long time. Excellent product. The Scotty base unit will mate up with the hardpoints on the Ocean Kayak Mod Pod, giving you the ability to easily mount rod holders and electronic gadgets. Have not used yet, it looks to be able to do the job. ACK was quick to deliver. Plain and simple, try the rest then go with the best. Excellent product,good for spinning and baitcasting reels.A little stiff at first but, loosens up with use. Very well made heavy duty rod holder. Definitely 5-Stars all the way around !!!! Scotty Rod - Holders are the BEST!! And with the added Power - Lock, you don't have to worry about fish swimming - off with your trillion-dollar reel - & pole !!!! :-D Hooked a Huge Cobia, (45 - lbs.) And held my gear Perfectly until I was able to pick it up,, No problems at - all !! Will be buying another for Trolling - Pole to mount on my Ocean Kayak Trident 13 - Angler Kayak. The one I have on there now is mounted to the YakAttack Gear Trac 12 Inch,, & It fits flawlessly, Works GREAT!! ;-) HIGHLY RECOMMEND!! Peace Tommy in P'cola, Florida. Sturdy and strong. Does what its supposed to do. Works well and is secure. With my rods locked in these, I have no fear a fish will steal my rod! They are a little stiff when brand-new trying to open and close, but I'd rather it be a little stiff to begin with than really loose later. These work great in thye gimbal mounts on the Grady White! Definitely made for a larger Rod and Reel, using it for ocean kayak fishing. This is the best price Ive seen so far, great holder! Good strong, sturdy rod holder. But make sure that your handle is long enough. Because shorter handles won't sit perfectly on this one. This rod-holder was purchased to install on my ocean kayak... after shopping around, ACK had THE best price. Easy to install, and has made my fishing experience a lot more 'hands-free' while paddling. Great deal!!! I haven't really got to test it out live yet because it's winter. However, I was a little concerned that it might not hold my pole because I use a pistol grip with a closed face real, but it fits in there fine. I can also say that the Scotty Rod Holder is a LOT more sturdy than I thought it would be. It seems as if it can definately take a beating. I really like the lock feature so I don't lose my pole while I'm paddling. I also like the fact that you can remove it from the base so it doesn't get in the way when I'm not fishing. I would definately suggest you get this rod holder if you are fishing from a kayak. Excellent quality product, VERY good price and I still can't get over how fast I received my shipment.I don't think you will find a better online retailer than ACK. Thanks. I have two other Scotty rod holders so I just jumped in and pressed the add to cart button. I should have read the reviews because the picture is deceiving. This rod holder is for large offshore rods. It will work fine for the small inshore spincast or baitcast rods too but they are just a bit loose. Great item!! Great ACK Price!! & Works Great on my SOT kayak!! Nice product....but really hard to tell the size of product. Larger than I thought it would be. I like it but wish the product came with hardware and instructions on options of instalation. This rod holder is meant for a large rod and reel. I should have got the baitcaster instead. It might be useful someday if I get a larger setup for offshore fishing. I won't be able to try it until April, but it is very well made, and looks like it will work perfectly. Fast and efficient service from ACK! I bought this rod holder for my redfish kayak. It is much larger than the Scotty that came with my wilderness tarpon. It works great but I really wanted the smaller version. Keep this in mind if you are purchasing it for your yak. The order was shipped and arrived fast. Price was great and no shipping charge. The Rod holder works well. Highly recommend Austin Kayak. The Powerlock will accommodate the larger rod handles and the fact that you can lock them in when the boat is moving is a plus. Rod holder works great, it mounted perfectly to my kayak wish I had room for two. I had lost a part for a rod holder I had previously so I had to buy a new one to get the part I lost. These Scotty Powerlock Rod Holders are much more secure than the regular Scotty rod holders. I wish I had purchased them sooner! Nice, sturdy unit. Removal takes some getting used to, but I don't expect any major failure (in other words, rod won't unexpectedly get dumped). This was a good addition to my kayaks. If you enjoy fishing from a kayak you should have this to hold the rod til you get where your going or to troll behind you while paddling. I have got great comments on it. Thank you! Don't forget to take a kid kayaking!!! The Scotty Powerlock Rod Holder 230 is a great product, easy to lock and unlock. Great for holding a pole with a bottom rig. I think that the Scotty Powerlock 230 is one of the best rod holders on the market. Unbelievable. The Scotty Powerlock Rod Holder 230 worked very well. A little tough getting it in and out of the holder but would rather have that than it falling off the boat. Really like the power lock feature. Great product. A: This item detaches easily from the deck mount. Reattaching can also be done with ease, as you can lock it back into the mount by pushing down and twisting. Q: Where do I purchase the hardware to attach the Scotty Powerlock to my Lure Unitrack bracket? A: Most of our customers will just pick up a standard #10 screw and bolt from a local hardware store to attach this rod holder to at Feelfree Uni-Trak Accessory Mount. Q: Are camera poles and Scotty accessories compatible with this product? A: Hi,Thank you for the question to ACK. Scotty accessories are going to work on all scotty bases. They will have the same female and male receiving porting fro unit to unit. A: Hi, Thank you for the question to ACK. We would recommend using rivets first. If you want to use Well nuts we would then recommend the 1" and a 10-32 screw. Hi, Thank you for the question to ACK. We would recommend using rivets first. If you want to use Well nuts we would then recommend the 1" and a 10-32 screw. Q: I bought this with the Feelfree Uni-Trak Accessory Mount, but did not see any hardware (bolts/nuts) with either product in the shipment. Do you sell the appropriate hardware to join these two items? If not, can you recommend what to buy?